Sure, all year I can up food. But in the summer, we really get down to business! Our first crop of hot peppers is in, along with a few sweet peppers, too. Yesterday I picked just the largest of Will’s favorites, Hungarian Hot Bananas and boy are there ever a LOT of them out there in the hoop house! I put up 10 pints, about half in half-pints, the rest in pints. And in a week, I can do three times that much. 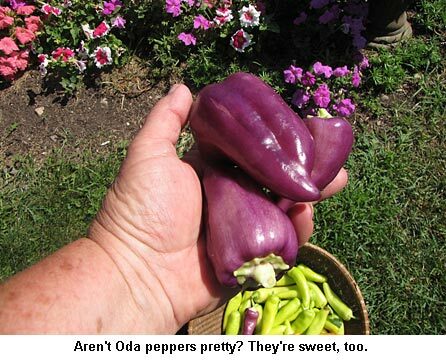 We tried a new pepper this year, Oda. And boy do I like it. It’s a beautiful lavender purple that just glows. It’s a sweet pepper but I mixed in the few that were ripe with the hot peppers to add pretty colors to the pepper rings. They’ll absorb some heat from the hot peppers but they’re mostly just for color. We’ll definitely grow more next year as they’re VERY productive! Our wonderful apprentice, Krystal, really hurt her finger badly when haying with Will last Wednesday. They were adjusting the bale chute on the square baler when the end of the tipped-up chute fell down. We all don’t know exactly what happened, but she got the end of her finger in the opening of the hinge and tore it up pretty badly — bone broken and hanging. We were pretty shaken up, I’ll tell you! We sped to the local hospital, then down to Duluth to St. Luke’s and the orthopedic surgeon. Good news is that with some repair and a pin, she’ll be as good as new when she heals. Thank you God! She’s a real trooper and today she is out raking hay while Will bales. I told her that if she gets tired or hurts, to let me know and I’ll finish raking the field. I found this recipe on the site ‘Chickensintheroad’, and she said the recipe was found on food.com submitted by “Bergy”. (the substitutions aren’t mine) I am going to try this, as the dreaded ZUCCHINI is always producing to the max, and I thought I would post this for everyone else looking for new ideas to use this versatile vegie. I would call this a green salsa??? 1. Day One: In a large bowl, combine zucchini, onions, green pepper, red pepper and the salt. Mix together, cover, and let sit over night. 2. Day 2: rinse and drain well, the zucchini mixture and put into a large pot. Add mustard, garlic, cumin, vinegar, brown sugar, pepper flakes, salt, cornstarch, nutmeg, pepper, tomatoes and tomato paste. 3. Bring to a boil and simmer for 15 minutes. Pour into sterilized jars and place flats/rings. 4. Water bath jars for 15 minutes to seal. So sorry to hear about the mishap and glad she is healing well. Loved seeing the jar of peppers. It is so nice to see the fruits of your labor neatly done up in jars on the pantry shelf. What a satisfied feeling it gives! We had wind but not that bad. Thank goodness. I hope everything at your place survived! 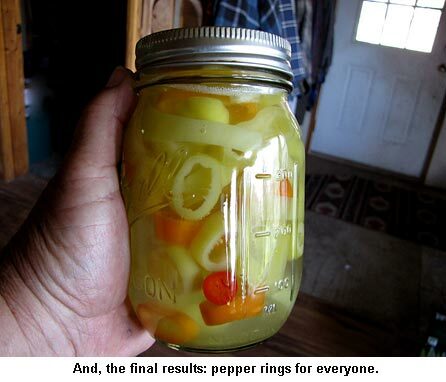 I’ve posted a recipe for the pepper rings here on the blog. 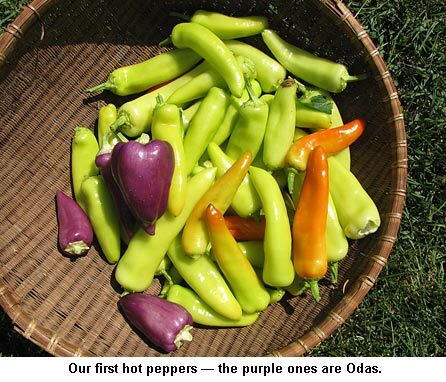 We love Odas but the purple faded during canning like the purple stripes on beans fades away. Oh well, they taste great anyway and will be gorgeous in salads. Krystal’s finger is healing very well; we go to the orthopedic surgeon tomorrow for a check up and I know he’ll be happy. I’m so glad to hear Krystal is going to be ok. She’s been a hard worker and must be a godsend to both you and Will. Wow, I am glad Krystal’s prognosis is good……fingers and farm equipment, gates, carpentry equipment and large livestock can be a tough combination. I hope your garden hangs in there – we are west/southwest of you and it has been blowing to beat the band all day and gusting to about 70mph at the local airport. We have had to prop up a broken tie on an old windbreak fence, pick up shingles off of buildings, nail a corner back together on one and pretty much put things in and tie them down. My portable plants are snug against the down wind side of the house but we have already had dead trees break off and roll across the pasture this summer…..! My best wishes to Krystal for no pain and fast healing. I’m very sorry to hear about Krystal, please give her our best wishes. I had to google your Oda pepper, and yours look better than the samples the seed company had photographed. Every time you mention your corn, I keep saying a tiny prayer for a bumper crop, I can’t seem to help myself. I really like the looks of the Oda pepper. How do you can those pepper rings? They look good too! I hope Krysta’s finger heals fast! Good thinking and fast action on yours and Will’s part! We have had hot and extremely humid weather in central WI. Are you having the same?